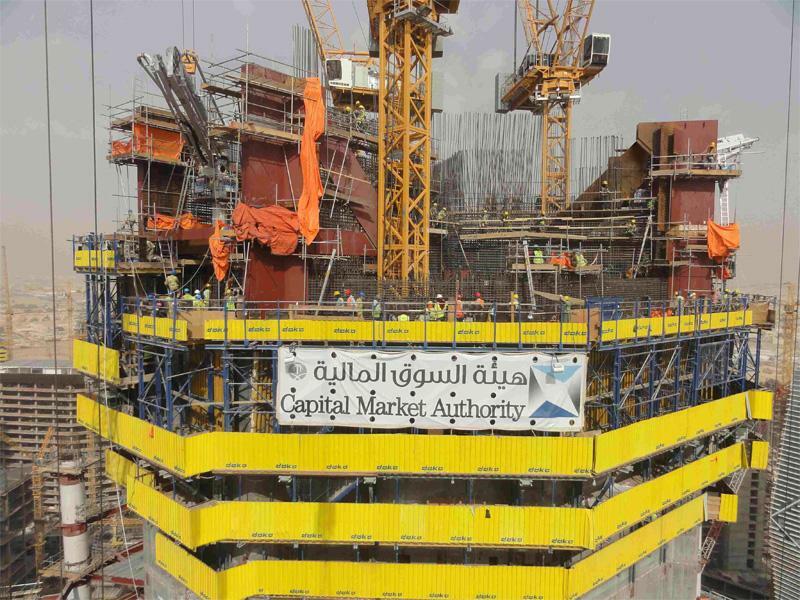 Set to top out at 400 m, the 76-storey CMA Tower in Saudi Arabia will be the tallest building in the city of Riyadh, in whose King Abdullah Financial District it stands. 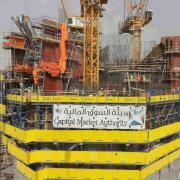 The CMA Tower is being built by SBG, a firm with a huge fund of experience in highrise construction. The tower stands out for its gigantic nine-sided CIP concrete core, whose 40 m cross-section makes it big enough to be a skyscraper in its own right. 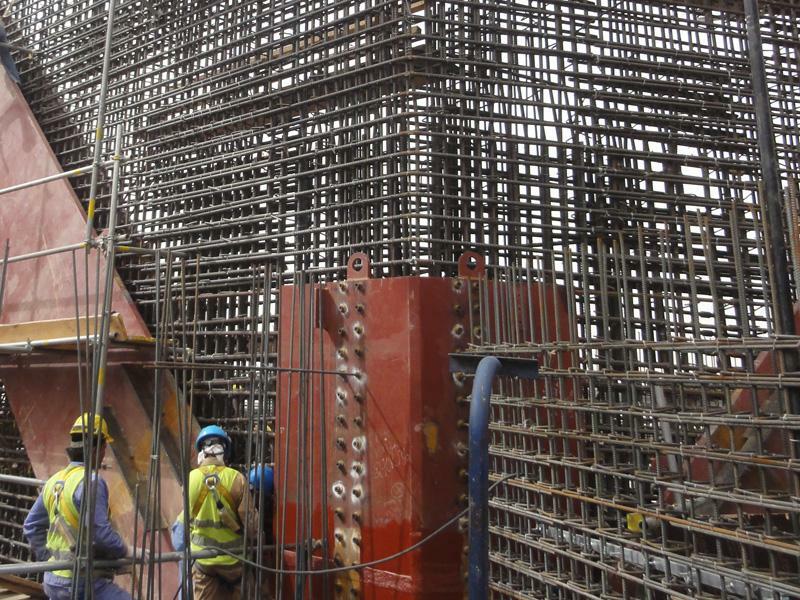 An ingenious formwork solution from Doka is in use for the 100 casting sections. At present, SBG has an uncommonly tough challenge to deal with: incorporating a three-storey-high steel construction into the CIP concrete core. Work on the up to 2.50 m thick reinforced concrete wall of the structure core has now reached the 29th floor, in some cases progressing in a 4-day-cycle. The colossal structure core serves as the bearing element for a gigantic steel construction to which the exterior facade and floor-slabs are to be attached. This steel construction will take several weeks to install, a procedure which will have to be repeated at the 51st floor. The complex fitting operations had to be carried out from the 26th to the 29th floors. In these three storeys, the steel construction was embedded in the CIP concrete core as this was poured, to assure a tension-proof connection between the core and the exterior facade. For this, 10 cm thick steel plates of up to 14 m in height were erected ahead of the casting operations, ready to be diagonally embedded. 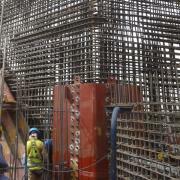 In addition, 12 m high reinforcement rods were also emplaced. Placement of the horizontal rebar proved particularly laborious, as every single rebar item had to be bolted onto the steel construction by way of welded couplers. The result, in the so-called ‘outrigger levels’, is a reinforcement ratio averaging 1500 kg per m³ of concrete. With so much steel in the concrete, tying the two formwork-halves and preparing the suspension points for the self-climbing system was quite a challenge. Another big challenge is a wall-return from 2.50 m to 1.80 m, which has to be hydraulically overclimbed by the platform levels. For this 70 cm set-back, the climbing scaffold is pushed away from the finished casting section, causing the scaffold to slant inwards in the next casting section. For this reason, Doka uses extension shoes in the casting section for the set-back, enabling the climbing scaffold to be pushed upwards and slanted inward by 20 cm in this casting section. Doka’s vast experience and wide-ranging project management are making it possible to solve the highly demanding requirements directly on the site, in teamwork with all the professionals involved. In consequence, the complex worksteps are proceeding as planned. Due to the decreasing rebar quantities, once the steel construction has been installed the site team are even aiming at a 3-day cycle. Thank you for your interest - Tough assignment on CMA Tower. Thank you very much for your interest - Tough assignment on CMA Tower.